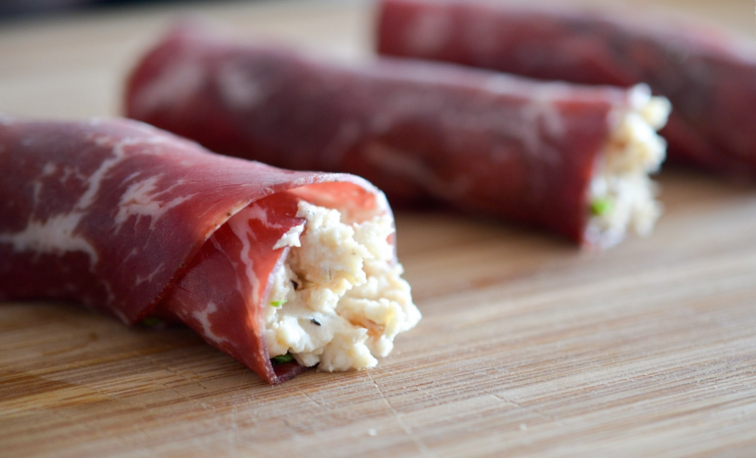 A very tasty and fresh recipe of wrap to enjoy at lunch or as an appetizer. Side dish: an aragula salad with Corsican clementine, accompanied with some toasted hazelnuts, orange vinaigrette and olive oil. 1. In a pan without adding fat, roast the hazelnuts. 2. In a mixing bowl, use a fork to mash the Rocaillou with chutney, cream, roasted nuts, salt and pepper. Taste for seasoning. 3. Spread the slices of bresaola on a board. Add a good spoonful of your Rocaillou mixture, some parsley leaves, and roll in order to obtain a breasola wrap. Cut each roll in half and serve with an arugula salad and Corsican clementines! You can also cut the rolls into small pieces and put them on hazelnut shortbread, to serve as an appetizer. Realize using wooden peaks with bresaola section, then clementine and finally a bit of hazelnut shortbread.